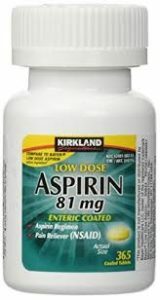 For several decades older patients have taken or been recommended by the cardiology world (and by us) to take low-dose aspirin (typically an 81-mg tablet of baby aspirin) as a preventive for heart attacks and stroke. And certainly we recommended that it be taken by anyone who needed a statin (such as Lipitor or Crestor) to control cholesterol or most people who were diabetic. The reason for this recommendation was the physiological understanding that heart attacks and stroke were often triggered by clotting of platelets passing through mildly atherosclerotic arteries, which should be helped by aspirin which reduces the abilities of platelets to clot together and initiate such a heart attack or stroke. That made sense. But it had not been proven. Three articles published in the New England Journal of Medicine last October disproved this belief in most circumstances for older individuals with no known heart disease. An editorial (“Should Aspirin Be Used for Primary Prevention in the Post-Statin Era?” by Paul Ridker) summarized the findings. In brief, based on several studies including one of over 19,000 people over 70 years of age in the US and Australia and followed for over 5 years, there was no improvement in the rate of heart disease or stroke or death from those events, but there was a meaningful increase in serious intracranial and gastrointestinal bleeds, including deaths. Life is complicated. While we will recommend that many of you taking aspirin for primary prevention with only cholesterol or diabetes as risk factors should stop, we want to give more careful thought in those cases where the underlying risk may be higher, such as with a strong family history of cardiovascular disease or with a substantially elevated cardiac calcium score. Most likely we will want those of our patients to continue aspirin. And there are other cases (such as known carotid artery disease) where aspirin is clearly still recommended. We plan to discuss aspirin use with each of you as we see you, if we have not already in recent visits. We want each of you to have the best possible medical risk prevention strategy, without being exposed to adverse effects without benefit.